Today's guest is Rami Ungar. Rami is the author of two of the short stories featured in Strange Portals, a fantasy horror anthology that is currently free on Smashwords, Nook and Kindle. Welcome, Rami. Can you tell us a little about yourself? I’m a senior at Ohio State University double majoring in History and English and graduating this spring (woo-hoo!). I specialize in horror, but I also dabble in science fiction and thriller. I’ve had this thing for scaring people since I was young. Someone scared me pretty bad, so now I’ve got the bug for it! Unfortunately, scaring people at any time of day is considered bad manners, so except for special occasions I usually save the scaring for my stories. I like to think I’m good at it, but you’ll have to ask my critics. I think I was five or six. I’ve always enjoyed books, but reading Harry Potter made me want to write stories like it. And I did, I tried to write my own Harry Potter Up until I was ten I wrote on and off, jumping between wanting to be a rock star, a mad scientist, a superhero, etc. I finally figured out that I wanted to write and be a novelist. A couple years later I decided to specialize in horror and it’s stayed that way since. Can you tell us about your story (or stories) in the anthology, Strange Portals? What inspired you to write it? I’m lucky to have two stories in the anthology, one or two more than I expected! One is Buried Alive, which is about a girl who is thrown into a coffin with her mother and the strange things that happen to her once she’s inside. The other is called Travelers of the Loneliest Roads, which is about a hitchhiker who gets picked up by a mysterious limo in the middle of the desert and what happens afterward. I don’t remember what inspired them exactly, but I’ve had them written for over a year. I tried getting them published in other places, but other places didn’t want them. Before I sent them to Joleene, I decided to look them over and see what could be done to make them better. I guess it worked, because Joleene said she enjoyed them and I’m really grateful that they’re both in the anthology. Please tell us about your other published work. I’ve got three books out right now. Reborn City is a science-fiction novel, about a street gang in a dystopian city-state, and a Muslim girl named Zahara who is forced to join them despite some gang members’ hatred of Muslims, a shadowy government conspiracy, and her own reservations. It’s a story about overcoming adversity when no one expects you to. Snake is a thriller, about a man who becomes a serial killer and starts hunting down members of the mafia in order to save the love of his life. It’s pretty dark, but that’s the way I like it. And there’s The Quiet Game, a collection of short stories that have gotten some good feedback. I’m really proud of all of them, and I hope that more people decide to read all three books in the future. Well, I’m working on a novel that doubles as my senior thesis. It’s called Rose, and it’s a traditional horror novel. I’m close to finishing the first draft, so I hope to get that out by the end of the year. I’m also editing the sequel to Reborn City, and I plan to rewrite another thriller I’ve written called Laura Horn. And if I can get enough short stories written, I might put out another collection. Just hope I find the time! Do you have a book recommendation to share with us? Battle Royale by Koushun Takami. I can’t recommend it enough. It’s my favorite novel. The language is beautiful and flowing, and nearly every character receives some character development. Plus the plot will keep you guessing right up until the end. I loved it, and if anyone has ever had any problems with the Hunger Games books, they might enjoy this novel immensely. Have a good group of supportive people around you. Obviously reading and writing are very important, and every writer who is serious about writing should do that, but having a circle of people around you who can help you is very important. At least half of what I’ve been able to do has been accomplished because of the people around me, most of them writers but quite a few people who aren’t writers, have been there to help me, point out what needs to be fixed, and brought me this far. If you’ve got your own circle of friends to help you, you’ll go farther than you ever could on your own. Rami Ungar is a student at Ohio Sate University who is studying History and English. For Rami, scaring people and writing are two of his greatest talents, so merging them is like a marriage of two great loves. His influences include Stephen King, Anne Rice, and James Patterson. When not writing, Rami enjoys reading, watching TV, and sneaking up on people when they least expect it. But before he can get to any of that, he has to do his homework. Tricia, this is beautiful. Thank you for this wonderful opportunity. I really appreciate it. 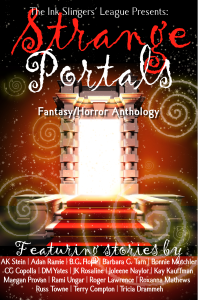 I'm happy to let everyone know that I've recently been interviewed by Tricia Drammeh of Authors to Watch about the short stories I published in the Strange Portals anthology last month and which she appears in as well. If you get the chance, please check out the interview. And while I'm talking about it, I'd like to thank Tricia for featuring me. It really means a lot to me and I hope I can return the favor sometime. Thanks, Rami. I really enjoyed having you here on Authors to Watch. Glad to be here. Let me know if I can return the favor some time.